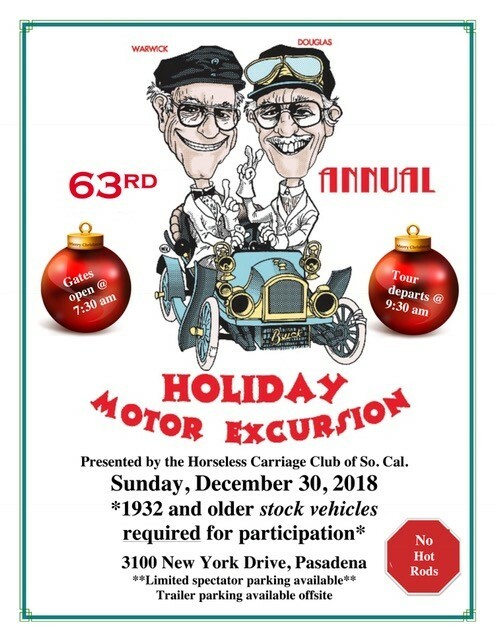 It's time to start getting ready for the annual Holiday Motor Excursion put on by the Southern California HCCA. Oh well, I still am looking forward to videos and lots of photos! I'll be there this year if the weather holds and I don't get sick at the last minute like last year. 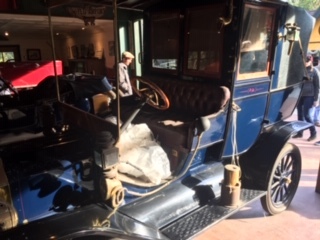 The upcoming Horseless Carriage Gazette will have a short article about the very first HME, started by their parents back when the authors were just little kids along for the ride. Will the "Little Old Lady" be there? Just seeing those two faces is Christmas to me. I remember a 2-cyl Buick owner cranking his car with no luck. One of them asked "Would you like me to have my brother start it for you?" Two of the most delightful fellows. Peter Eastwood, the son of Doug who is heading up the meet advised me to park my truck and trailer down in Pasadena on a big wide residential street, and drive my car to the meet about a mile away. There is not going to be much room for trailers there. Why not just drive your T and leave your trailer home? You know it's not That Cold here in SoCal or you just want some more snooze time? This year's location looks pretty small compared to the Race Track!! Hope everyone noticed the location change! I didn't..
Where is this "parking" at? I'll be trailering from Simi Valley. 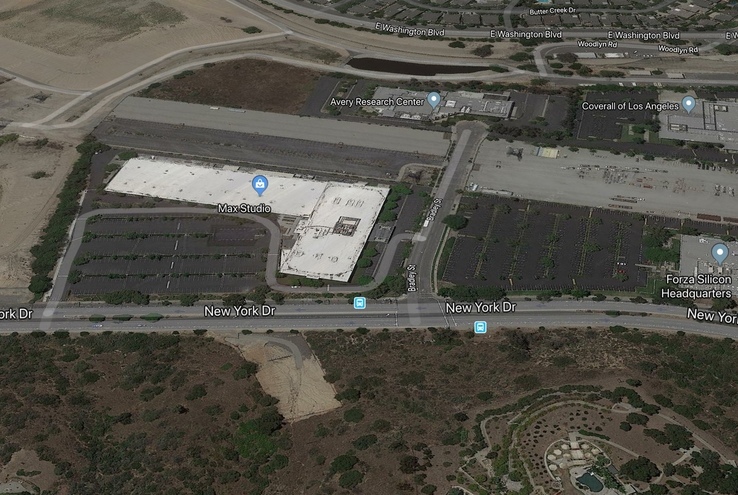 I'm going to park my truck and trailer down on San Pasqual Street, which is a big wide residential street about a mile away. What about the Pasadena DMV parking lot? Should be plenty of parking as its closed on Sunday. Does sound like a good idea. Has anyone checked the weather for rain? Phil, make sure to say Hi. I don't think I've met you. BTW.... Does anyone need a ride? I have an open seat for someone. How about one of you Out of Town guys??? The HME is something to have on your Bucket List. Don't think that thought has not crossed my mind but our schedule before and after the HME doesn't allow for my attendance this year. For those not familiar with the HME please go to our club website to learn more. I also keep the site up to date with the latest info for the event. Kirk, Glad you saw that and I wondered if you considered working it into your plans. Chris, Thanks for keeping the site current. We'd like to hear about the change in venue. The new location was found by one of our board members. Its a nice parking lot with room for about 300 tour participants. No room for trailer or spectator parking (modern cars) this year. If you plan to trailer best to follow the advice that Larry was given and park south of our starting location. Then you will also be much closer to your trailer at the end of the tour. Note the gates do not open before 7:30 am. We will have parking reserved for tour participants, those driving a stock car/truck made before 1933. 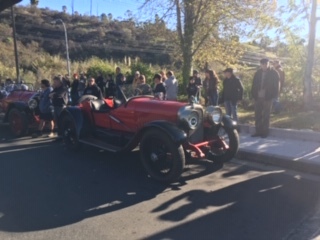 If you are driving a more modern collector vehicle (newer than 1932) then you will be directed to another part of lot, separate from the tour participants. Weather permitting we expect we will fill the parking lot to capacity. At 9:30am tour participants will be given route instructions and sent on their "merry" way. Please check out our website to learn more about the history of the event. The Eastwood Family started something great that Peter and the rest of us are trying to honor. In SoCal virtually every other weekend is for cars shows, this one is for touring! Is there a Walmart or large shopping center nearby where the trailers can park? 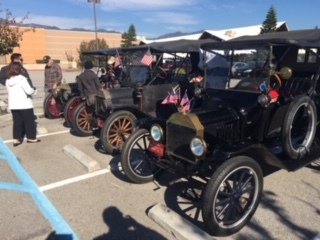 I have added this year's registration form to our website so you can fill it out before arriving at the Holiday Motor Excursion. Looking forward to seeing old and new friends at this great institution. Now to decide what car to bring and make sure it runs!!! It's been Heavy Thick FOG here at the Beach the last few mornings until late! Not sure about driving the T in the fog when I like leaving at first light??? I'll decide on the 29th I guess when I get up if I'm going to get the trailer ready or not. I still have an open seat and there's still time for somebody to make plans to attend! Just send me a PM. Gene not sure how far inland that FOG has been going. There has been no sign of it up here near Pasadena. Here's a short video link to the "send off". Thanks Bill for that ray of sunshine. 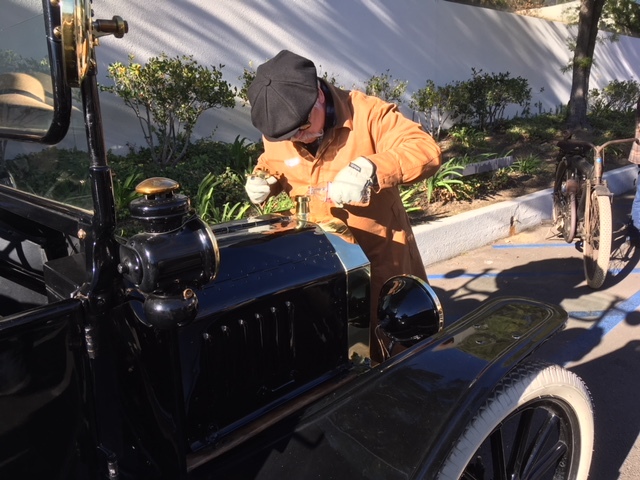 Today I went up to Pasadena to attend the Holiday Motor Excursion, in which about 200 pre 1932 cars run around Pasadena looking at many sites including some beautiful homes. 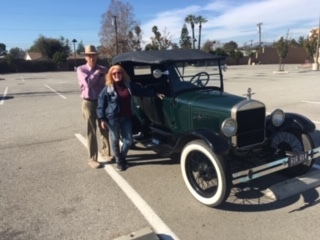 I went with Greg and Cathy Rising in their 1926 T Touring. We meet many folks from previous tours, even a couple from my home town of Ramona! Greg and Cathy by their beautifully restored 1926 Touring. A rather nice Town Car at the home of the dessert stop. A perfect day for the excursion. Topping off before the run. I made it with my 1911 touring. Had a great time until the route sheet blew out of my hands. I found out it's hard to drive and read directions. Next year I'll bring a co-driver. After the lunch stop I decided it was in my best interest to head home. The best part is my 107 year old car ran flawless. Was a great day and a lot of fun. I drove my Torpedo up the 405/605/210 freeways and despite forgetting my gloves I made an easy run with light traffic. My Garmin said I averaged about 53 MPH. I got there just before 8 and the parking lot was very crowded with lots and lots of modern cars trying to get in the rather small parking lot. Several cars from the Long Beach, Orange County, San Diego and other clubs were there. From the parking lot on the tour I logged 68 miles with a moving average of 23mph for just over 3 hours of driving time. Then that must be Perrier water he is filling it with! Bill, I think some of those T drivers need to drive more. Seemed a little rusty. Just guessing, but is that "Handlebar" Ed? Thanks for taking us there Bill. Regards to all my T friends for a great 2019. Larry I just saw your 1913 T Runabout...�.in the youtube video Bill posted...���...nice. 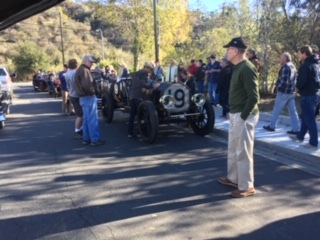 It was another great Holiday Motor Excursion filled with old friends and lots of great cars-some of which haven't been out before or have not been seen in years. Thanks to the SoCal HCCA, Peter Eastwood and the rest of the folks that continue this important tradition. Happy New Year. What did Jay leno Drive? Jay Leno drove a Rolls Royce this year. You can see him drive in at the 21:12 mark in the video posted by Bill Harris just above.